A core is a sand or metal insert used to shape any part of a casting that cannot be shaped by the main, removable pattern. When a pattern is pressed into sand and then extracted the impression it leaves must be concave. Cores allow more complexity in the design. With well-constructed cores, the foundry can create holes or chambers in the casting. Automotive engine molds might have up to five cores in them to create the chambers necessary for the working of a combustion engine. Cores can also help create angles that would be impossible with a pattern. Any overhang above an empty space would make it impossible to withdraw the pattern without breaking the overhang. In these instances, a core can be used. 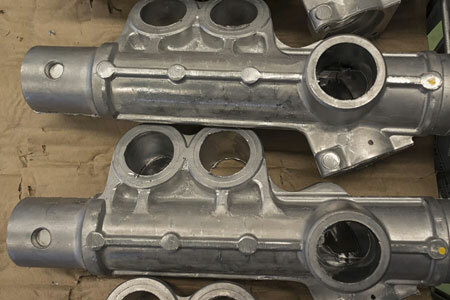 Castings using internal cores usually have some opening in the outer shell of the molding to extract the core after casting, though this opening might be plugged mechanically during finishing. Cores made of sand are designed to break down; internal cores are quite literally shaken out of the casting at the end of the process. The “shakeout” opening is also helpful for the placement of the core. Any place the core touches the mold is a place where molten metal cannot flow, so to get a consistent thickness of metal a core must “bridge” the space to be filled without touching any sides. To achieve this, the core normally is longer than the casting, and held into place by divots in the sand outside the casting pattern. If the core is very long, or only one edge can protrude from the mold, then chaplets are used to help anchor the core in place. Chaplets are often made of the same metal as the casting, as some of the chaplet metal will be incorporated into the casting itself. To bond securely with the rest of the casting, the chaplet’s surface must melt—but first, it must do the job of supporting the core. The design of chaplets is therefore a tricky metallurgical process avoided when possible, as there is always the possibility of introducing weakness or casting defect when using a chaplet. However, chaplets are sometimes the only way to create certain structures inside a casting. Sand cores are prone to floating on the liquid metal, sometimes rising enough to break. Chaplets placed above and below can help keep the core in the proper position. The top chaplet must be the stronger, to counteract the pressure of metal and gas pushing up in the mold. The tendency of the core to float is one reason precise understanding of the mechanical strength of the core sand is important. Tests of shear and tensile strength are done on core sands are similar to the tests explored in our foundry sand article. 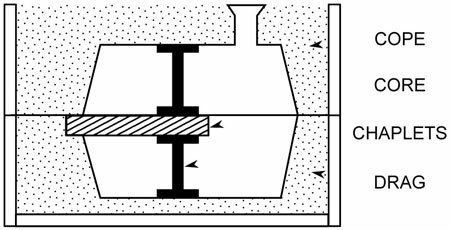 If the shear strength of the sand is below that of the pressure created by the liquid metal filling the mold, the core might split and create a distortion in the casting body. Binders are a big part of the core-sand making process. Green sand cores are made from standard damp molding-sand mixtures, and a binder, like dextrin. Cores of this type are very fragile and can be made with an arbor or interior wires to facilitate handling. Dry sand cores do not contain water. 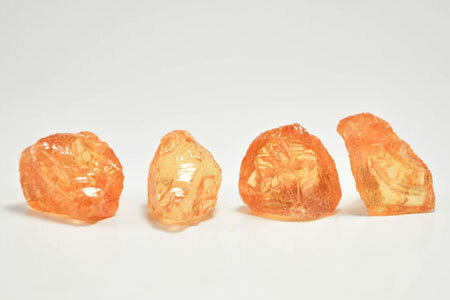 They are made from silica sand and a binder to harden the surface. 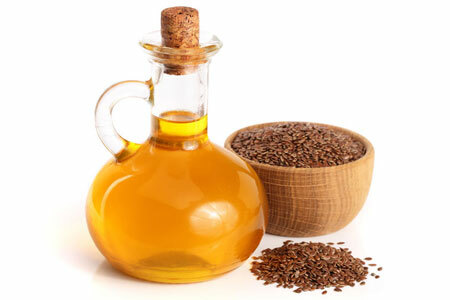 Linseed oil is an important component of traditional core oil, and originally comes from flax seed. A transition in core binder technology happened starting in the 1980s. For hundreds of years, core oil was the traditional core binder—and is still in use some of the time. Linseed oil mixed with smaller amounts of resin and a thinner, such as high-grade kerosene, would be added to dry foundry sand to create core sand. Additives like corn flour, dextrin, paper-mill by-products, or protein binders might be added to strengthen the core. These would usually burn up in the high heat of pouring, allowing the core to collapse and be easily shaken out. Other traditional binders included coal tar pitch and petroleum pitch, especially stable for large cores. Wood and gum rosin was also traditionally used to enhance core collapsibility, although these rosins would tend to cake in heat and humidity. Many of these traditional compounds have been replaced with synthetic options, so that the desirable traits are kept but the challenges removed. Modern foundries therefore have cleaner core-making processes that support better air quality and are easier to implement on the foundry floor. These synthetic “chemical set” cores allow several advantages, including low temperature baking, easy collapse during shakeout, and less off gassing during the core-making process. Today, the most commonly used core binders are plastics of the urea- and phenol-formaldehyde groups, and furan resins. There are three categories of resin binder processes: cold-setting, cold-box/gas-hardened, and hot-curing methods. Cold-setting processes begin to harden after the last additive has been stirred into the sand, like cement does. They are chemically self-setting processes. Common examples are furan resins and phenol-formaldehyde resins which are acid-catalyzed. They begin to cure after sulfonic acid is stirred into the sand. Timing is important to these processes—the sand cannot set so slowly it interferes with production, nor so quickly that it is hard to manage the reaction. Cold-box, or gas-hardened processes introduce a gas to the core box which reacts chemically to harden the core binder. For example, sands enriched with furan resins or epoxies can be hardened by introducing SO2. Water glass, or sodium silicate, can be hardened using the CO2 process. Powdered natural rosin was traditionally used as a binder in core sands. Cores are made by many of the same methods employed for sand molds. In addition, core blowers and screw feed machines are used. Core blowers force sand into the core box by compressed air at about 100 lb/in2. They can be used for making all types of small- and medium-sized cores. The cores produced are very uniform, and high production rates are achieved. Screw feed machines are used to extrude plain cores, usually cylindrical. The core sand is pushed through a die onto a core plate. The use of these machines is limited to the production of stock cores: the long, extruded cylinder created by the machine is baked and then cut into desired lengths. Core driers are like cake pans in that they support the shape of a core while it is in the core oven baking. These are usually light skeleton iron or aluminum boxes, the internal shape of which conforms closely to the cope portion of the core. Cores that would crumble or have parts break off when placed on a flat plate go through the oven in a core drier. In order to create castings with hollows, chambers, or holes, cores are often needed. After a core is finished curing, it will often be finished by hand. Along the parting lines of the core box there might be “fins” to be filed. Sometimes, cores are made in multiple parts, if the needed shape is larger than the coreboxes and ovens on hand. A segmented core is put together after the curing stage. When the cores are smooth and joined they are placed in racks to wait for use in the mold. Cores are almost always placed carefully by foundry workers rather than inserted by a machine. Chaplets, if any, go down into the drag first, and then the core is placed. The foundry worker makes sure the core sits correctly in the mold and is free from deficits. Any chaplets needed are placed on the cope, and when everything looks good, the cope is placed over the drag and clamped down. 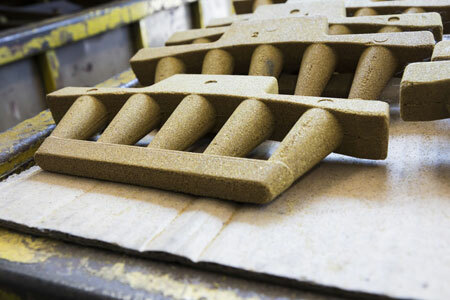 The ability to make and place sand cores is a vital part of the casting process. In some instances, the core is necessary for the utility of the final part: tubes, engines, and other mechanical devices often need to be hollow to work. For decorative items, cores can also cut down on the total cost of metal. Especially when casting in iron, cores can substantially reduce the weight of a final product. Where the mechanical strength of solid steel is needed this may be inappropriate. In other circumstances, however, a core is a good design consideration, even if it is not necessary to the function of the product.